Annmarie Skin Care > Healthy Lifestyle > Himalayan Salt Lamp Benefits — Real or Placebo Effect? Once upon a time, the ASC team would draw a name from a hat and that lucky person would get to keep our office Himalayan pink salt lamp on their desk for a whole month. The lamp made its way around the office and everyone felt a sense of love and peace when it was their turn to work alongside it. We’d heard that there were some benefits you could get from using a Himalayan pink salt lamp, which made us wonder if our love of the lamp was the result of the placebo effect and the excitement over having our name drawn, or if there are real benefits. As usual, we wanted to do a little research to find out the truth. There are a lot of articles that talk about the Himalayan salt lamp benefits and a lot of articles that report that while they’re great, they don’t quite live up to all the hype. We dug a little deeper into the research and here's what we found out. Dirt, dander and allergens all get trapped in airborne water molecules in the air around us. Since salt is naturally hygroscopic — meaning it pulls water molecules out of the air — the dirt and grime trapped in the water vapor get stuck to the salt lamp when the water molecules are drawn to it. The heat produced from the lamp dries the vapor leaving the allergens and dirt particles on the salt. It’s thus important to clean your salt lamp every couple of weeks with a damp cloth to remove all this grime. It may be obvious, but the more surface area the lamp has, the more effective it will be because it will be able to hold more allergens. If you have ever spent time next to the ocean, a waterfall, or sat outside during a rainstorm, you know how calming the water is and how clean the air feels. That’s because when water crashes, the molecular bonds break and negative ions are released. Negative ions are good for you for several reasons, the main one being that they pull positive ions from the air. Positive ions are released by things like electrical devices and air pollution. They have been linked to asthma and depression so you can imagine that it’s in your best interest to neutralize them before they can impact your health. Negative ions bind to positive ions in the environment, neutralizing them before they have a chance to get into our bodies and wreak havoc. Studies have shown negative ions to help increase serotonin and oxygen levels in the brain, which can decrease drowsiness, alleviate stress, and boost energy. In fact, some studies suggest they’re as effective as antidepressants for people experiencing chronic depression or seasonal affective disorder. So do the lamps release negative ions? Himalayan pink salt lamps are often touted for releasing negative ions into the air and therefore being beneficial for all the reasons we just talked about. And they do release a very small amount, but it’s negligible in comparison to what you're exposed to during a walk after a rain. To get any real negative ion love from your salt lamps, you would need to have it on for days in a space where you’re sitting all the time. The surface area of your salt lamp makes a difference here as well so a small salt lamp will release fewer negative ions than a larger lamp. I think this one is my favorite because it uses color therapy. Color therapy is an ancient therapeutic technique that uses the different wavelengths of colors to alter mood. It’s shown to have physical, emotional and spiritual influences, although they are very difficult to quantify. In the natural environment, the sun’s rays penetrate the atmosphere and turn the sky blue. Blue light is energizing and mood elevating so natural daylight helps to control our circadian rhythm. However, the screens we look at all day long and the LED and florescent lights above our heads give off a blue light, too. When we’re continuously exposed to artificial blue light, we can get burnt out by it. The overexposure leads to increased bouts of eyestrain, headaches, and mental fatigue. The Himalayan pink salt lamp lets off this beautiful pink/orange glow that is reminiscent of a sunset. Just as the blue light is energizing, the slower wavelengths in the warmer colors are relaxing to the mind and easier on the eyes. I think about it like the difference in the natural energy cycle at high noon and at sunset. The salt lamp is great for balancing the extra blue light. Himalayan Pink Salt Lamp: Yay or Nay? We still aren’t sure if what we experienced was the placebo of getting our turn to have the lamp on our desk or a mixture of all the positive (if small) changes that it makes to a space, but we’re saying yes to the Himalayan pink salt lamp. Even though they don’t make a huge difference in negative ions and they aren’t going to be as effective as an air purifier, they make a great addition to a space and definitely have a positive impact in some way. The aesthetic alone makes the lamp worth keeping around, and if it has an effect on the air and helps to calm our minds even in the slightest, then it’s even more worth it! What do you think about the Himalayan salt lamp benefits? Do you have one? 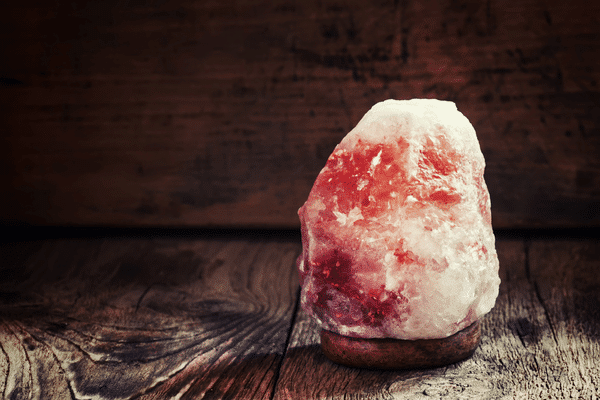 Negative Ionizers – Himalayan Salt Lamp Benefits: Do Salt Lamps Really Work? Blue Light Exposed – Where Is Blue Light Found? Thanks for sharing your knowledge with us. I have Himalayan salt lamps in my house. I personally love them. These lamps are just more than awesome. They are not only beautiful but also have healthy and healing benefits for human mind and body as you have mentioned above. They eliminate all the dust particles and smoke from the air and make it pure and fresh. They help me in relieving stress and depression and improve the sleep cycle. I bought my lamps from ittefaqco at a very reasonable price and they are of great quality. You can visit their website if you want to. Thanks to sites like this one,I bought 3 salt lamps. One that’s about a foot,and a half tall,with 2 smaller ones for: the master bedroom, living room,and home office. It’s been over 3 months now,and I feel they are keeping the air fresher/cleaner than my air purifier ever did. As for affecting our mood.I would say to some extent, yes due to the salt lamo’s warm glow. I always prefer,and use a dimmer for low light anyways. Trying to be “greener” by reducing emissions as much as possible. Drive a plugin car. At some point,I would love to install a battery wall, powered by solar. Placebo or not, I wouldn’t give up my salt lamp for anything. Mine has about 40 salt crystals rather than the one large one. It casts light patterns and shadows on the wall. I find that it’s better to manage the expectations before purchasing one for the health benefits. They work for me, but the effects aren’t sudden. They’ll come gradually and you’ll realise you aren’t so lethargic. Sort of like meditation, stick to it long enough and you’d feel the change. I have three… in my bedroom, living room, and classroom where I teach. I see them everywhere now…just wondering where would be a place to get a good one. Not sure the ones at see at the local stores are the real thing. Ordering them online or getting them at a local store is perfectly fine! I would recommend etsy. A lot of people make their own stuff on there. We’ve had a salt lamp in the bedroom for many years, however we don’t know if it makes a significant difference or not. Shortly after purchasing it, the little “light” that was inside stopped working. I have never purchased anything that has this kind of light to last very long as the lights are very cheap and poor quality. So we always wonder if the salt lamp has any beneficial effects at all without the heat and light coming from the bulb inside. So my advice is to purchase a salt lamp that will accommodate a votive candle instead of electric bulbs. This means that there is an opening in two places for air flow. Candles don’t break and they don’t emit EMFs. Great post. I’ve been on the fence about getting one. Love the look, but wasn’t sure if everything else was just hype. I already wear orange goggles at night (there is a picture of me wearing them in one of my early blog posts????) if I am on my devices, but love the idea of having this warm light also.